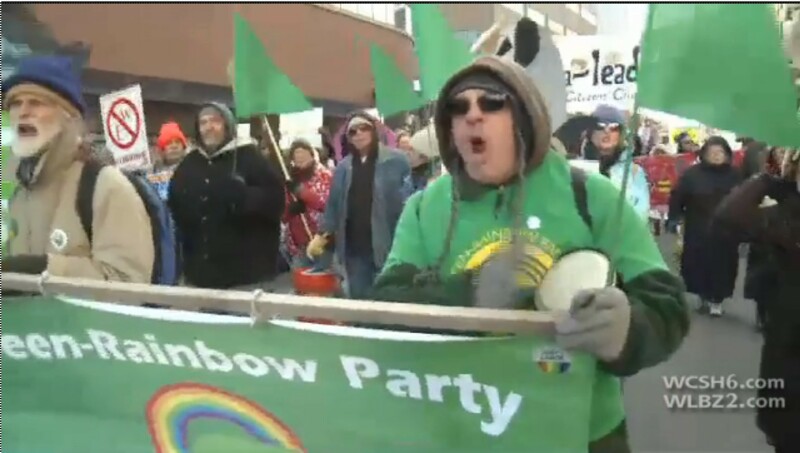 TV footage shows a nice clip of the Green-Rainbow Party contingent at the rally to stop the New England tar sands pipeline. (click here to view) It includes Rick Purcell and Wes Nickerson leading a chant and carrying our banner. Green-Rainbows brought Green flags and Maine Greens brought signs saying "Political change, not climate change: Vote Green Party". People were carrying them all over the parade. Maine Greens also collected hundreds of names and contact info. Portland Green City Councilor Dave Marshall and I both got to say a few words at the rally before the parade. And I had the honor of speaking at the New England Occupy conference after the rally. People seemed hungry for the Green perspective that we need to stop fossil fuel politics - and the political parties that enable it - if we want to stop the fossil fuel melt down of the climate. And we got a terrific response to our call for peace, forgiving student debt, Medicare for All and a Green New Deal as the real solution - ending climate change and creating an economy for all of us. 350 New England organized a great rally. Big thanks to all who came out today to make it deeply Green, including the super-powered crowd of UMass Amherst Campus Greens. Maine Greens and the Massachusetts Green-Rainbows are a dynamite combination in the street. Our message resonated all over the rally. Can't wait to do it again! See the TV coverage at http://www.wcsh6.com/news/article/229043/2/Hundreds-of-protestors-rally-for-an-end-to-tar-sands-oil-extraction- .